To see the power and simplicity of our Couple6 software, please take an interactive tour by clicking on the tabs below to see details on each Step in the process. To navigate between the 5 main alignment steps, manage project files, print reports and change alignment settings, just click on the tabs above to see details for each Step. 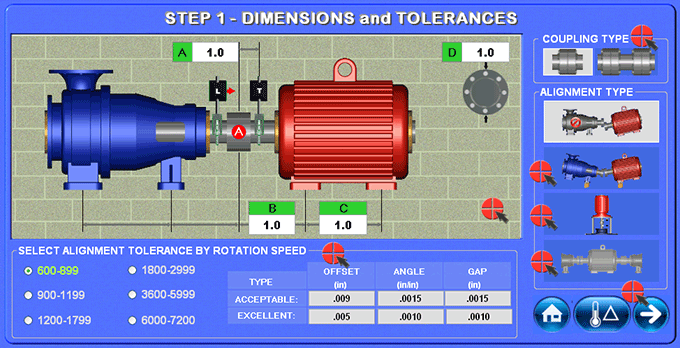 In the MOTOR SETUP SCREEN the motor’s foot dimensions, machine description and desired alignment tolerances are entered. Choose the coupling type (flexible or spacer) and alignment type (Standard, Bolt Bound Vertical Pumps or Machine Trains). 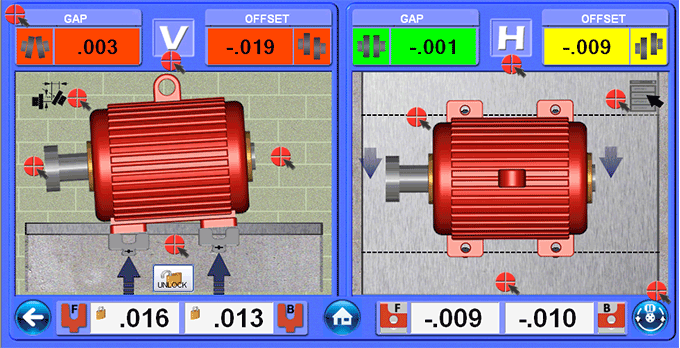 Thermal growth offsets (the amount the motor grows from a cold start to operating temperature) are also entered at this stage by clicking on the Thermal Growth icon and opening the modeling screen. Navigate between the 5 main alignment steps, manage project files, print reports and change alignment settings. 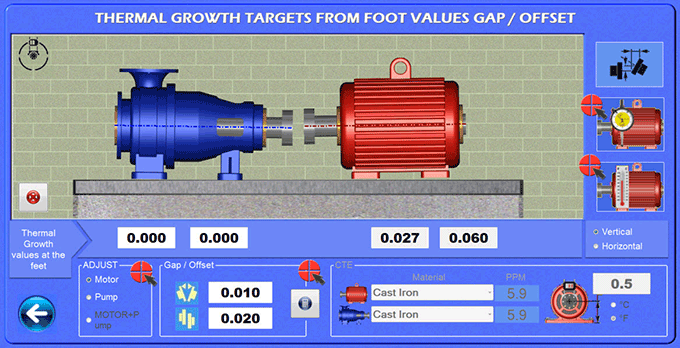 Thermal Growth is an optional screen and is not included in the 5 main steps in Couple6. It can be opened by clicking on the Thermal Growth Icon in the Step 1 Dimensions Screen. 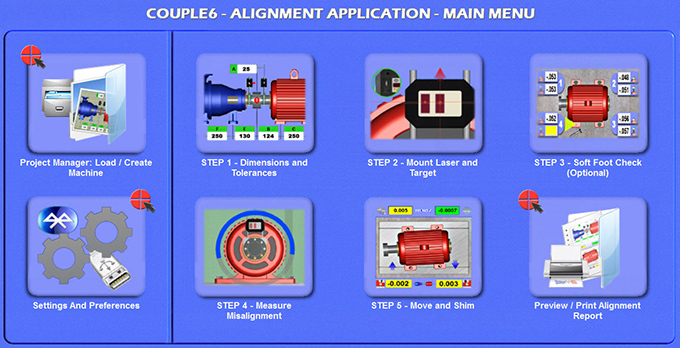 Enter thermal growth offsets in Coupling Mode or Foot Mode and go back to Dimension Screen and Couple6 will automatically apply these offsets to the alignment in Step 5. So after aligning the machine, with these offsets applied, the motor will be “misaligned” by the offset value. 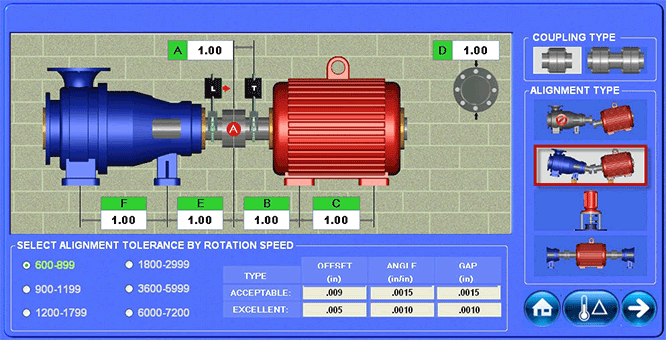 This means when the motor (or pump) gets up to operating temperature, it will “grow” into alignment. Values can be entered either at the feet or the coupling. 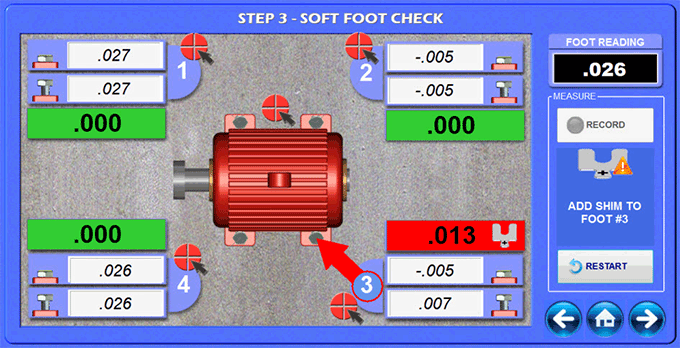 There is also a foot calculator where you can enter the foot temperatures and the material type and Couple6 will calculate how much the feet will grow and how much this will affect the alignment at the coupling and the feet. All thermal growth offsets can be applied to the horizontal axis too! 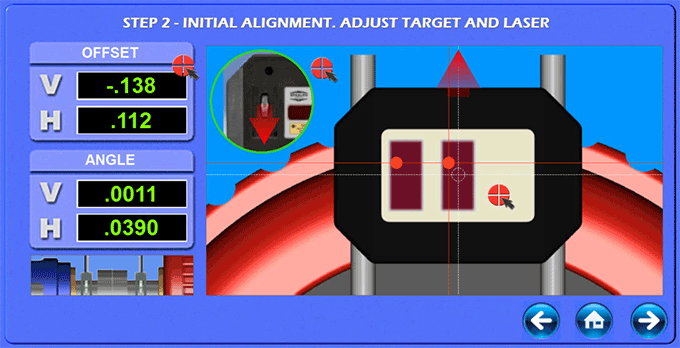 With our S-680, the Step 2 Laser Setup Screen provides a live display in all 4 alignment axes (2 measurement planes) to adjust the laser or target to maximize the measurement range of the target. However, the system can still be used even if the laser beams are not aligned. Normally, with the large measuring range of the Stealth Series, it is not needed but in cases wherelarge motors are installed, this screen can be used to “rough in” the motor’s angular misalignment so the laser can take data for the final alignment. For the vertical axis, simply rotate the laser from 12:00 to 6:00 and average the 2 angular readings, which gives you the rough angular misalignment in inches/inch or mm/100 mm. Multiply this by the C dimension from Step 1 and add or subtract the result from the front or back feet to align the angle of the motor. Repeat this for the Horizontal axis by rotating the laser from 3:00 to 9:00. Our Soft Foot Check & Correct Screen displays an easy-to-follow soft-foot routine that finds potential soft-foot problems and recommends corrective action. We do the calculations for you! To use the Soft Foot Screen, simply hit Record with the bolt tight. Then loosen it and take a second reading. Couple6 will then record the difference. Repeat this for all 4 feet and Couple6 will find the foot with the biggest difference and if it is greater than the tolerance, it will recommend the shim to add to fix it. 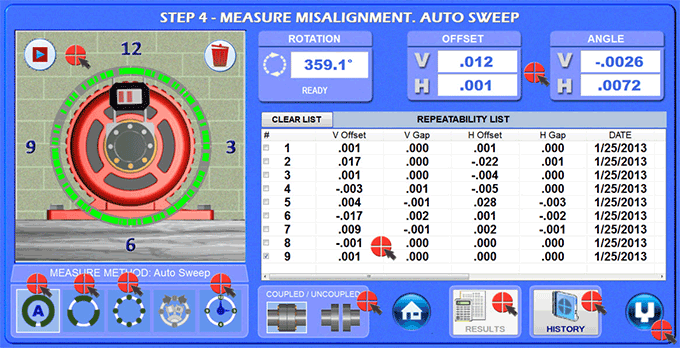 Couple6 offers FIVE different data-taking modes to handle any kind of shaft alignment application. The most popular data-taking mode is Auto Sweep™ which makes taking data extremely easy. Just rotate the shafts and data is automatically taken! Once the data is taken, Couple6 pops up a window showing the data and if accepted, it will then be put into the Repeatability Table for comparison to previous sets of data. Then highlight a set of data and click the Results button to see the results with tolerances applied. Multiple sets of data can also be averaged and used for the alignment if repeatability is a problem.Data can also be added to History for archiving purposes. Utilizing our Duo-Plane™ live move screen, Couple6 simultaneously shows both the side and top views of the motor’s alignment and displays 4 continuously updating alignment axes (2 alignment planes) on the same screen. Even better, arrows on the display tell you which way to move the motor and the graphic update with each move of the motor! The displays are color-coded to indicate if the alignment is out of tolerance (red), in Acceptable tolerance (yellow) or Excellent tolerance (green). The angular values can be displayed as angles or gap with a click of the button. And our uniqueFlip-It™feature allows you to flip the motor if you find yourself on the wrong side. The data-updating speed (averaging) can also be adjusted to smooth out fluctuations in the readings due to air turbulence or vibration.